1 F None No Power Seat 1 F is a standard Business Class seat however, the proximity to the lavatory and galleys may be bothersome. 13 A None No Power Seat 13 A is a standard Economy Class seat that may have limited recline due to the exit row behind. 13 B None No Power Seat 13 B is a standard Economy Class seat that may have limited recline due to the exit row behind. 13 C None No Power Seat 13 C is a standard Economy Class seat that may have limited recline due to the exit row behind. 13 D None No Power Seat 13 D is a standard Economy Class seat that may have limited recline due to the exit row behind. 13 E None No Power Seat 13 E is a standard Economy Class seat that may have limited recline due to the exit row behind. 13 F None No Power Seat 13 F is a standard Economy Class seat that may have limited recline due to the exit row behind. 14 A None No Power Seat 14 A is a standard Economy Class seat that has extra legroom due to the exit however, may also have limited to no recline due to the exit row behind. 14 B None No Power Seat 14 B is a standard Economy Class seat that has extra legroom due to the exit however, may also have limited to no recline due to the exit row behind. 14 C None No Power Seat 14 C is a standard Economy Class seat that has extra legroom due to the exit however, may also have limited to no recline due to the exit row behind. 14 D None No Power Seat 14 D is a standard Economy Class seat that has extra legroom due to the exit however, may also have limited to no recline due to the exit row behind. 14 E None No Power Seat 14 E is a standard Economy Class seat that has extra legroom due to the exit however, may also have limited to no recline due to the exit row behind. 14 F None No Power Seat 14 F is a standard Economy Class seat that has extra legroom due to the exit however, may also have limited to no recline due to the exit row behind. 15 A None No Power Seat 15 A is a standard Economy Class seat that has extra legroom due to the exit. 15 B None No Power Seat 15 B is a standard Economy Class seat that has extra legroom due to the exit. 15 C None No Power Seat 15 C is a standard Economy Class seat that has extra legroom due to the exit. 15 D None No Power Seat 15 D is a standard Economy Class seat that has extra legroom due to the exit. 15 E None No Power Seat 15 E is a standard Economy Class seat that has extra legroom due to the exit. 15 F None No Power Seat 15 F is a standard Economy Class seat that has extra legroom due to the exit. 28 A None No Power Seat 28 A is a standard Economy Class seat in the last row of the plane. The close proximity to the lavatories and galley may be bothersome. 28 B None No Power Seat 28 B is a standard Economy Class seat in the last row of the plane. The close proximity to the lavatories and galley may be bothersome. 28 C None No Power Seat 28 C is a standard Economy Class seat in the last row of the plane. The close proximity to the lavatories and galley may be bothersome. 28 D None No Power Seat 28 D is a standard Economy Class seat in the last row of the plane. The close proximity to the lavatories and galley may be bothersome. 28 E None No Power Seat 28 E is a standard Economy Class seat in the last row of the plane. The close proximity to the lavatories and galley may be bothersome. 28 F None No Power Seat 28 F is a standard Economy Class seat in the last row of the plane. The close proximity to the lavatories and galley may be bothersome. 9 A None No Power Seat 9 A is a standard Economy Class seat that may have slightly extra legroom due to the position of the bulkhead. There is no floor storage for this seat during takeoff and landing. 9 B None No Power Seat 9 B is a standard Economy Class seat that may have slightly extra legroom due to the position of the bulkhead. There is no floor storage for this seat during takeoff and landing. 9 C None No Power Seat 9 C is a standard Economy Class seat that may have slightly extra legroom due to the position of the bulkhead. There is no floor storage for this seat during takeoff and landing. 9 D None No Power Seat 9 D is a standard Economy Class seat that may have slightly extra legroom due to the position of the bulkhead. There is no floor storage for this seat during takeoff and landing. 9 E None No Power Seat 9 E is a standard Economy Class seat that may have slightly extra legroom due to the position of the bulkhead. There is no floor storage for this seat during takeoff and landing. 9 F None No Power Seat 9 F is a standard Economy Class seat that may have slightly extra legroom due to the position of the bulkhead. There is no floor storage for this seat during takeoff and landing. On select flights - for a fee, passengers can access the internet via on-board Wi-Fi, as well as have the ability to use their smartphones to make calls, send texts, and send emails during the flight. Qatar Airways operates the A320 on short-haul flights, within the Gulf region. This aircraft flies in a two class configuration with 12 flat bed Business Class seats and 120 standard Economy Class seats. 1A was perfect and the galley and toilets not bothersome at all. Crew kept curtain fully drawn at all times and never even noticed. In fact proximity to toilet and galley is a blessing. Nice room between seat and bulkhead..plenty of storage in overheads and around seat. New full lie flat seats and service as always exceptional..my favourite airline. 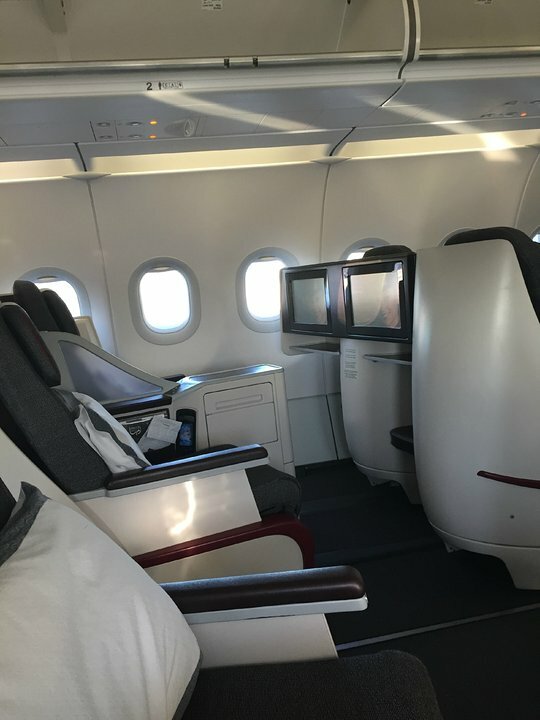 Arrived after 5 hour flight from Bucharest to Doha feeling fresh for my 14 hour connector to Sydney! 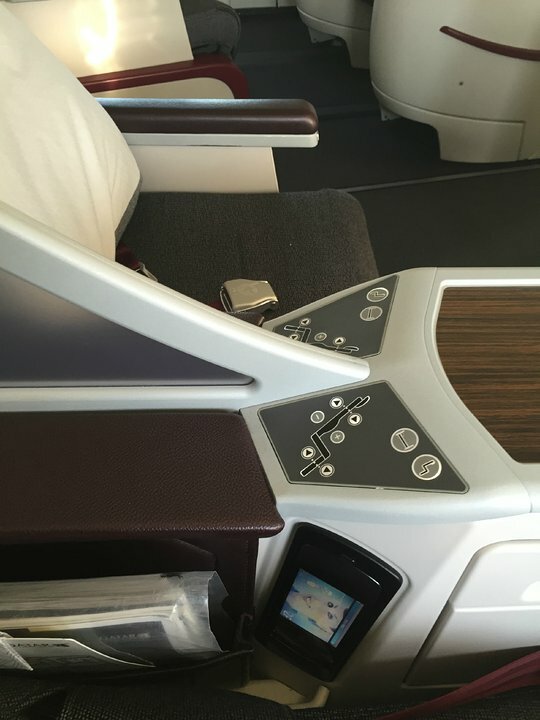 The business class seat was fullreclined and very comfortable.The leg room was wide enough. I was able to recline well, although I did notice the gentleman in 14C was not able to recline.